February 25, 2013 / Author: Tara Haelle / Reviewed by: Chris Galloway, M.D. Most parents are all too familiar with children developing ear infections. The trick is figuring out if it's a infection that requires antibiotics or if it's better to wait it out. The American Academy of Pediatricians has issued new guidelines for how doctors should treat children with middle ear infections. These guidelines are important for parents as well to understand what treatment to expect and what to ask about. The guidelines state that a middle ear infection should only be diagnosed if the ear drum is bulging. The guidelines provide specific information about when to consider prescribing antibiotics. Not all children require antibiotics for middle ear infections. Other recommendations include keeping children up to date on their vaccines, breastfeeding infants and keeping children away from secondhand smoke. "Talk to your pediatrician about children's ear infections." The clinical practice guidelines committee, led by Allan S. Lieberthal, MD, FAAP, updated the guidelines that had been published in 2004 by the AAP. These guidelines should be applied to children aged 6 months to 12 years old who have acute otitis media without complications. 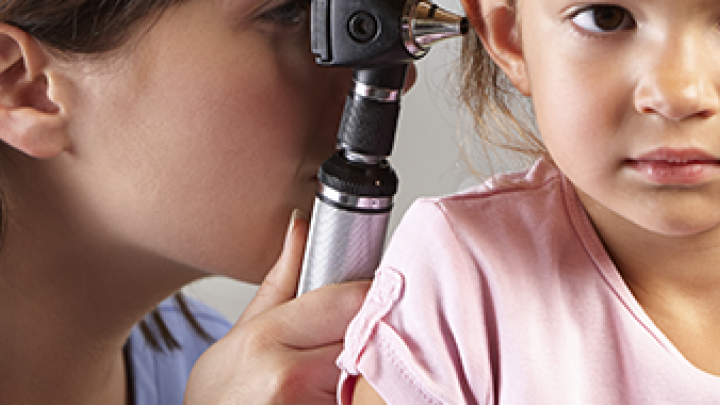 Acute otitis media is a middle ear infection, which could be bacterial or viral. The biggest change to the new guidelines is that middle ear infections should only be diagnosed when children have moderate to severe bulging in their ear drum or if they have fluid coming from their ear that is not related to an outer ear infection. The guidelines state that doctors may diagnose a middle ear infection if a child has mild bulging of the ear drum and has had ear pain within the past 48 hours or has a severe rash on the ear drum. "The doctor has to be sure they see the ear drum and decide if there's bulging of the ear drum or no bulging," Dr. Lieberthal told dailyRx. "This diagnosis is the most important change," he said. "The way it impacts parents is that there will be fewer diagnoses of bacterial ear infection and therefore less use of antibiotics." Dr. Lieberthal said ear infections will often improve on their own. "Most of the time with an ear infection, if it comes on during the night, by the morning, it's better, especially if the parent uses acetaminophen or ibuprofen," Dr. Lieberthal said. If it's not better and parents take their child to a pediatrician, the pediatrician should follow these new guidelines. If the child has pain, then the doctor should suggest pain relief treatment. If a child is 6 months old or older and has a severe middle ear infection in either ear, the doctor should prescribe antibiotics. A severe middle ear infection involves moderate to severe ear pain, ear pain for at least 48 hours or a temperature of at least 102.2 Fahrenheit (39 Celsius). If a child is aged 6 months to 2 years and has a non-severe middle ear infection in both ears, the doctor should prescribe antibiotics even if the child does not have severe symptoms. If the young child only has a non-severe middle ear infection in one ear, the doctor may prescribe antibiotics or may suggest waiting to see whether the infection improves on its own. If the doctor and parents together decide on observation instead of antibiotics, the child should receive antibiotics if the the ear infection gets worse or fails to improve within two to three days after symptoms started. For children aged 2 and older with a non-severe middle ear infection in one or both ears, the doctors can also offer antibiotics or observation. Again, a child that doesn't improve within 48 to 72 hours after the symptoms start should receive antibiotics. If the child is to receive antibiotics, the doctor should prescribe amoxicillin first as long as the child hasn't had amoxicillin within the past month, doesn't have pink eye and isn't allergic to penicillin. If the child has received amoxicillin within the past 30 days, has pink eye, or has a history of not responding to amoxicillin, then the doctor should prescribe an antibiotic with beta-lactamase coverage for middle ear infections. No matter which course of action is chosen, a child who doesn't improve in two to three days should see the doctor again. The clinical guidelines state that children who get ear infections often (chronic otitis media) should not be prescribed antibiotics when they don't have one in order to prevent an infection. The doctor may choose to prescribe ear tubes for children who get frequent middle ear infections. "Frequent" means the child had three infections within six months or four infections within the past year, including one within the past six months. In addition to these guidelines, the report made recommendations for preventing ear infections. These included making sure all children receive their pneumococcal conjugate vaccine according to the immunization schedule of the Centers for Disease Control and Prevention. Also, children should also receive the flu vaccine each year, according to the CDC immunization schedule, to reduce the likelihood of ear infections. Dr. Lieberthal noted that most middle ear infections follow a respiratory infection. Two other preventive measures for decreasing the risk of middle ear infections are breastfeeding babies exclusively for the first six months and keeping children away from exposure to secondhand tobacco smoke. Dr. Lieberthal said, if antibiotics are prescribed, parents should feel comfortable asking their doctor whether they are necessary. "We encourage parents to ask doctors if antibiotics are really needed," he told dailyRx. "What we found after the 2004 guidelines was that while physicians are reluctant to give up their old practices, parents who are aware of the risks of antibiotics should be asking the physician if their child really needs antibiotics." The clinical practice guidelines were published February 25 in the journal Pediatrics. The report did not use external funding, and the authors declared no financial conflicts of interest. Pediatrics, "The Diagnosis and Management of Acute Otitis Media"